Hope you had a stunning weekend. I thought I would do a post on what I love to wear on Saturdays. Saturdays are usually my lazy days. I love to sleep late, drink coffee all morning and just put on my sneakers and comfy leggings. I dress up and go all glam on Sundays but my Saturdays are usually my chill days. I will definitely do a look post on what I love to wear on Sundays too, so look out for that. Now Cape Town has been particularly chilly this past week therefore I have been wearing my winter coats and boots every day. I took the outfit photos below a while ago when the sun was still out and about in Cape Town. Revlon Photoready Pressed Powder in Light/Medium 020: I never wear liquid foundation as I prefer to wear pressed powders because it works great for my combination skin. I have an oily t- zone, so pressed powder keeps my face matte throughout the day. 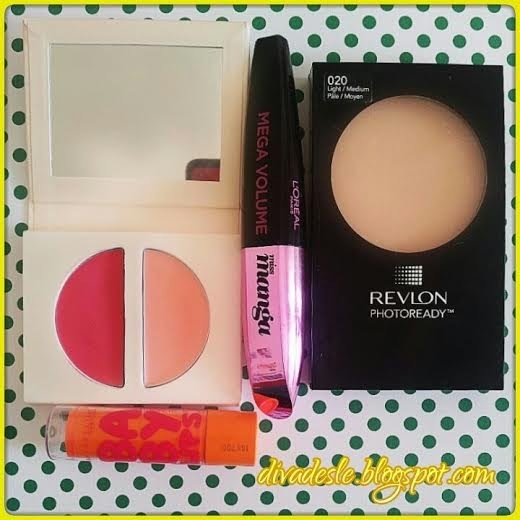 The Revlon Pressed powder gives a natural sheer coverage which I love. L'oreal Miss Manga Mascara: This is my favourite everyday mascara by far. This drug store product elongates my lashes and gives me a dramatic lash effect. The formula is quite wet and thick. So do be careful as lashes can get clumpy. I love this mascara because it makes my eyes look glamorous when I don't wear eyeshadow. L'occitane Facecolor Cream Duo Blush in Rose Reverence: This is the only cream blush I own as I prefer to wear powder blushes. When I want a more natural rosy glow on my cheeks I opt for this pretty cream blush by L'occitane. It comes in two shades, a bright rosy pink and light peach colour. I use my fingers to blend in the blush. You can also use a stippling makeup brush. I love the natural flushed look it leaves on my cheeks. Maybelline Babylips in Cherry Lips: These tinted Babylips products are perfect to wear on days when you don't want to look too over done. This shade gives a slight tint of cherry red colour on the lips. Again I love that it looks natural and rosy on my face. What do you ladies love to do on Saturdays? Let me know below. 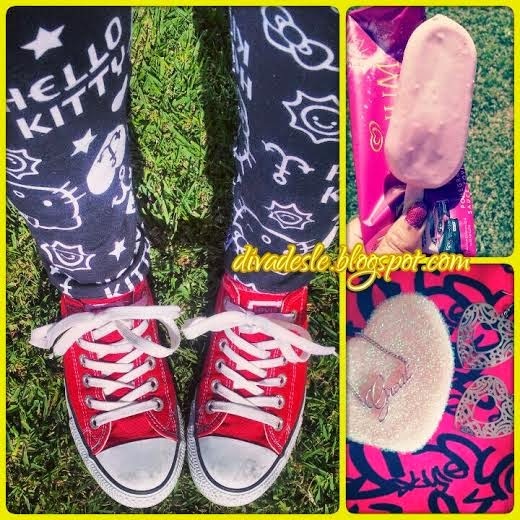 The Hello Kitty leggings are adorable!!! Love the make-up picks too.. And the ice-cream.. YUM !!! Thats a great selection of makeup. Thanks for your opinion on my last post...hope your week is going well.